We emptied the pantry over the course of a few days. Hadn't used something in a while? The yard sale pile kept growing. I wanted glass jars, but I realized that my Tupperware works for now. I'm still looking for narrow spice shelves that will fit between the pipes on the right. Tanna identified some of my blind spots, like a sentimental bread box from our first kitchen. As she pointed out, why let an empty picnic basket take up space? I filled it with my emergency stash of plastic forks, paper plates, napkins. Other hospitality items, from foil pans to baskets, line the upper shelf. We moved this bookcase from Elise's closet to the area Tanna suggested. For now it holds cookbooks, plastic bags, and that restaurant size aluminum foil I bought at Sam's Club. After clearing out the waste, the unused, and the excess, so much space remains! It's time to get back to the pantry principle: stocking up on the items we regularly use when they go on sale. I can't wait to implement some of the creative ideas you shared in the comments, too. Wow! You've have made big strides there towards improvement! Good for you! EXCELLENT, meredith! looking good! i have been doing (and blogging about) a lot of purging and reorganizing as well. it is so incredibly satisfying. i wish we had a good spot for a yard sale collection. we don't, so i donate and offer on freecycle. for now, this works, especially given how much i have received on freecycle and how much i have acquired used through the charity's sale. Absolutely love this series your doing. So real life and helpful. looking better inch by inch! Congrats on your improvements:)! Oh...you and all your helpful commenters are invited to my house to organize my "pantry" space (a few shelves in the laundry room, and some space in the basement. Please? Come rescue me--I need help! WOW What a transformation! You've inspired me with my own pantry. I have things in there that really need to get stored under the house and a major shelf clean to do. You must love just going into your pantry now and revelling in your accomplishment! Is it just me, or is an organized pantry a thing of great joy and beauty? I'm about ready to break into a hymn over here. I used to have an entire ROOM in a finished basement for my pantry. When we had to sell our big house, I really missed that room. It was wonderful but one good thing about downsizing, I save money because I have to THINK more about what is most important. Deb, you know me too well! That was a $1 Kik Step stool I spray painted white. Way to go Meredith! Looking great, I am so happy to see your pantry coming together for you. You have done a great job! I'm loving the pantry posts! I too have a very narrow pantry. Right now we are only using half of it(hoping to make the other half a powder room) but it's working well. I'm keeping my eye out for tips on here! Here's a thought, lately at my Goodwill there have been metal shower caddies. They have three shelves or so. I think they might make a good spice rack. If you can't hang it from a pipe you could just screw it into the wall. The pantry is coming together beautifully! I didn't notice the potatoes and onions like the other commenter, but they do need to be stored separately because of the sprouting issue. One way to get glass jars is to buy a case of the half gallon ball jars. I've found them at the Reading China and Glass Outlet in Lancaster, PA. I think Amazon offers them. It was about $12.99 for a case of six. I've been asking around for glass jars for our pantry, but it seems that most food supplies for businesses are provided in plastic buckets rather than glass jars. IKEA is a 4 hour drive from me, which is probably a VERY good thing right now! Looks great Meredith! I've been slowly adding glass canisters found at Goodwill to our pantry for storage of bulk, dry goods. My husband also came upon three boxes of Ball jars on one of his morning runs that someone put out by the street as free to a good home! And thank you to the commenters who mentioned potatoes and onions should be stored separately! I have mine in a basket together and kept wondering why the last two bags of onions I picked up at Whole Foods kept sprouting on me LOL! It looks GREAT! What a change. I often let so many areas get out of control and when I take the time to reorganize it makes me so happy! Now if I could just get the spare bedroom/scrapbook/my computer/junk room in order I would be over the moon. You've done an amazing job in very short order...congrats! I also have started finding/using canning jars for storage. There are some big ones that can hold an awful lot and the quarts hold enough of one thing to keep the majority in storage in the basement and just enough on hand for quick cooking. Best of luck with the final touches! Great progress Meredith - it's looking quite tidy and neat! We made the switch to all glass jars for food storage after reading about the hormones in plastics affecting our boys especially, but we did it bit by bit as we saw them on sale - and decided that the expense was worth it in the long run since we've already been down the surgery road twice with our guy. It's often just about finding a balance and doing the best you can with what you have - and you are great at that!! Hi Meredith! We just gutted out kitchen and guess what? I'm going to have my FIRST EVER walk in pantry, too. It's gonna be tight, but it will work. Woo Hoo. 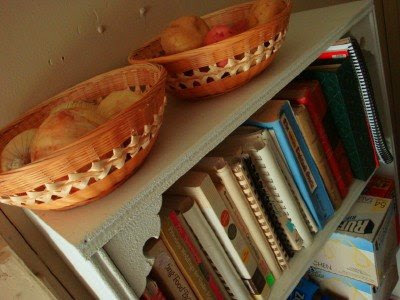 Love all those wicker paper plate holders! When my husband was a bachelor, he had a Sam's membership and had a HUGE aluminum foil roll. He brought it into our marriage and it was at least another year or longer before it was used up. I was so glad when it was finally gone!!! There was no good place for it. 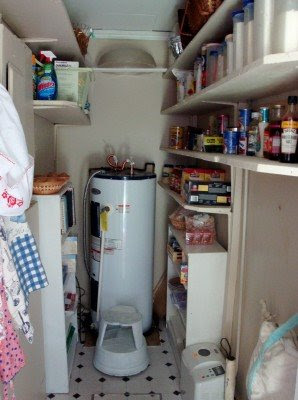 Oh, I am planning to start a pantry in our basement under the steps for things we use a lot that are on very good sale. I want to start small. Goodness, girl! You've been busy! Looks great! I don't even use glass for my flour and stuff, and I'm relatively picky about that kind of stuff :o) Dropping a tupperware full of flour is messy. Dropping a glass container full of flour might send me over the edge! That is wonderful! You are giving me some inspiration today. I really need to weed through our pantry and pull out the old and expired stuff. Thanks for inspiring me this morning! This just does my heart good this morning! 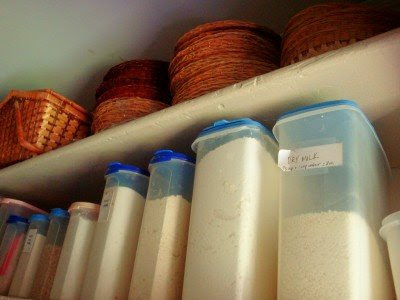 You pantry looks so nice and organized and it will help you find things alot easier. I'm going down through posts I've missed and I am becoming even more inspired. I need to stock up again on stuff we normally eat and to add to my food storage (long term).